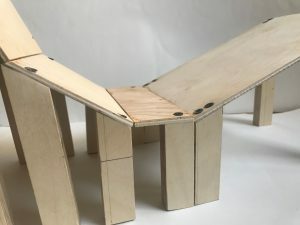 For my final, I created a chair that will foster interaction, intimacy, and social connection. I came up with this idea because I believe The New School does not have a student community as strongly as other schools. We are very individual people, we go to class rarely with the same people, our campus is spread throughout the city and we work on many individual projects. 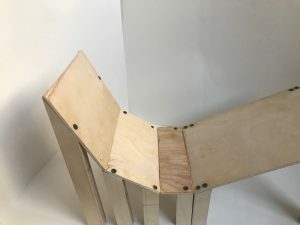 I wanted to create a chair that would force people to look at each other, or at least be aware of someone else’s presence. Visually, I sketched the structure so it would consist of two laid back recliners facing each other, creating a mirrored shape. 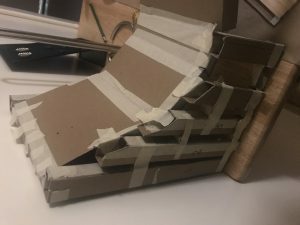 Upon creating my chipboard model, I realize that I needed to incorporate vertical posts to support the chair. 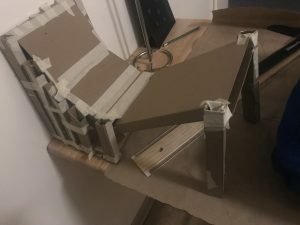 The hardest part of this project was definitely cutting the angles. Choosing to do them arbitrarily was much more effective than measuring because of how inaccurate and unskilled I was with the bandsaw. If I were to redo this project, I would definitely change the angles, and try to be a bit more patient with myself. I feel I started messing up and got mad at myself for messing up which caused me to make more mistakes. Slowing down would’ve helped me.